At Garden Media we know that without a good reputation, you’re sunk. As experts in creating brand leaders within the garden industry, we know a lot about the power of a good reputation, and we’re excited to share some of our insider secrets with you! Each month we have decided to release a new e-book featuring a case study that illustrates a specific public relations strategy, along with tips on building your reputation and strengthening your brand. 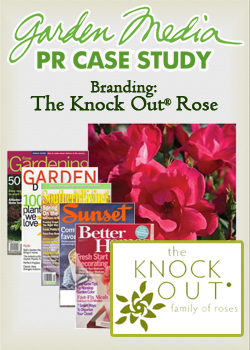 “Branding The Knock Out® Rose”, the first case study in the series, outlines the public relations strategies used to help launch The Knock Out® Rose, now one of the best-selling shrubs in America. But the most exciting part of the case study series is our new monthly eBook club. At the end of each month, I’ll host a On Air Hangout on Garden Media’s Google + page. Just sign up for our virtual book club to receive the eBook of the month, discussion topics and an invitation to the On Air Hangout. During the Hangout we will dig deeper into the case study and answer all your questions. Additionally, we’ll have four new blog posts a month with corresponding content right here on this blog to help you better understand the topic and spark discussion topics. Our goal is to propagate more business successes within the garden industry by sharing our expertise, PR tips and secrets, and we hope you’ll join us! If you would like to receive a new e-book each month and be part of the conversation – sign up here!